When I first heard about this chocolate telegram from Chocol@, I fell in love with the concept. When my own telegram arrived I was truly smitten – a long brown leather-like box containing 36 chocolate squares spelling out: CHOCLOGBLOG. CHOCOLATES. THX. CHOCOL@. What a fabulous and witty idea. Compose a personalised message to your friends, family or business contacts, have it written in chocolate and then have it sent through the post to arrive at their door. 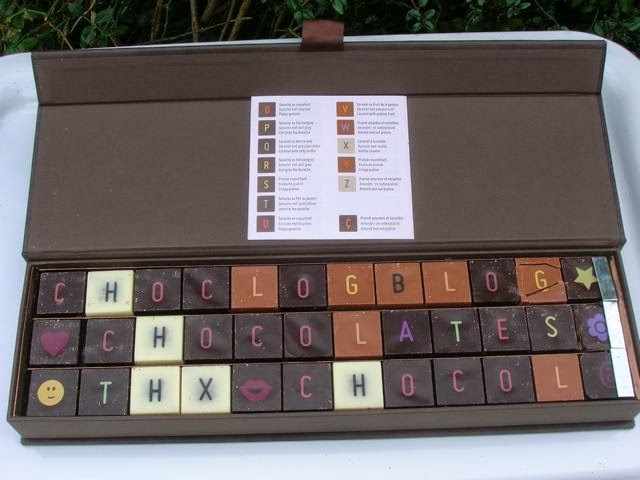 With the square chocolates on which the letters and characters are printed, it has the air of a superior (and edible) scrabble board. I’m a seasoned Twitter user and rather like the idea of condensing a tweet’s 140 characters down to 36 – constructing a cogent message will focus the mind and chances are it will live on in the memory as sweeter than most tweets. The chocolates, by Belgian chocolatier, Jean-Philippe Darcis, are a mixture of dark, milk and white and have various fillings according to the letter, number or character on the top. They are described as being made with the finest ingredients, but I was unable to discover what these were. Perusing the accompanying leaflet, I was gutted to find I didn’t have a single salted butter caramel, even though there are 14 flavours and 56 characters, so every flavour is repeated several times; I needed an 8, K or Q. If you like word play, the description of each letter and character on the website is worth a read in itself. G Spot: These few grams are filled with enough gusto to propel you to the seventh heaven of taste pleasure. You can go gaga over this lemon flavour in a chocolate robe. We’ll understand. It’s all in good taste. The chocolates are very nicely presented and are sturdily packed. Despite this a couple of mine were broken in transit. I was rather hoping there was going to be a second layer nestled under the first, there was certainly room for one, but my greedy hopes were not realised. The box is sturdy, deep and of good size, measuring 10 by 38 cm. The material is some sort of soft leather substitute in brown with gold stitching and the box is closed by means of a magnetic catch. Once the chocolates have gone, it can be used for any number of purposes; CT thought a refill was the most appropriate. Now, the box might be useful, but what about the taste of the chocolates? CT and I got stuck in. On opening the box, there was a good strong smell of chocolate which permeated our nostrils and stimulated our tastebuds. We found we couldn’t eat many in one go, which is usually a sign of a good quality chocolate, one that is rich with complex flavours rather than just pure sugar. G- Milk chocolate covering a dark chocolate lemon ganache – quite sharp in a nice way and not too sweet. H – White chocolate covering a liquid caramel which was delicious despite being rather sweet. White chocolate seems an odd pairing for a sweet caramel we thought. T – Dark chocolate covering jasmine tea flavoured dark chocolate ganache. The flavour of jasmine was quite noticeable and it had the drying quality of dark chocolate and tea. We both really liked this one. A- Dark chocolate covering a violet ganache – powerful, not in the least bit subtle, but very nice if you like parma violets, which I do. It wasn’t too sweet. S – Dark chocolate covering a nutty praline with crispy bits. Very tasty and not too sweet. B – Milk chocolate with a coffee ganache – not too strong and quite sweet. Lips & Smily Face – Dark chocolate covering a liquid ginger caramel which was gorgeous – warming and spicy and not too sweet. If you ever get tired of saying it with flowers, you can now say it with chocolate – from £38. You could have a lot of fun dreaming up complex words that incorporate all of the flavours. I was sent a Chocol@ telegram to review. There was no requirement to write a positive review. As always, all opinions are my own. I love this so much… I think we should start a chocolate chain letter… you can start by sending one to me! Haha, great idea Dom – no nasty messages though. I love it too. What a brilliant idea and so personal! I was really taken with it and haven’t seen anything else quite like it before. oh isn’t it wonderful. well jel as my friends say! Well jel? That’s a new one on me Fi, so I’ll assume it’s a compliment. OOh yes please! Although I am not sure I could bring myself to eat the message… What am I saying? Of course I could. I saw some chocolates like these at salon du chocolat nad I bought them with personalised names.They make nice gifts. Oh how lovely Nayna – I bet the recipients were pleased. I LOVE this idea too and I HAVE sent one of these to my daughter when she was promoted at work! Great fun! Fantastic Karen, I bet she loved it. Did she? What a fab gift that would make for teh chocoholics in my life! Wow! That’s such a cool gift idea! I wish my family were into twitter and they’d get the joke! Good point Sarah, the name could be quite meaningless to those not on Twitter. Great idea. And you can give yourself the perfect message too. Sounds like lots of heavy hints are required Galina. Man, I would love one or two or three of these. Haha, sounds like you need to drop a few heavy hints to Bintu. Looks great, it is quite expensive though! This looks like a fun concept, perfect for Valentines. Love it! This would be perfect for my husband. What a great idea, wouldn’t that be a treat to receive! Great idea for a fun (and yummy) pressie! Perfect for Valentines Day I’d say, all you romantics out there take note.